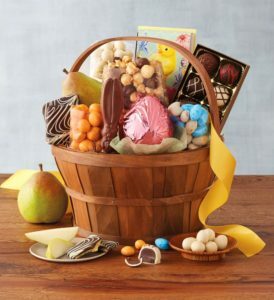 When it comes to chocolate eggs, bunnies and other treats, it seems there has never been so much choice for chocolate lovers around the world. 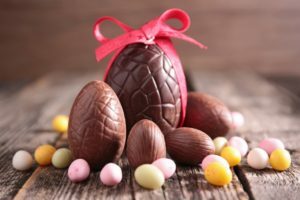 According to Mintel Global New Products Database (GNPD), there has been a delicious 23% rise in Easter chocolate launches over the past year providing a plethora of chocolate choice for Easter egg hunts across the globe. 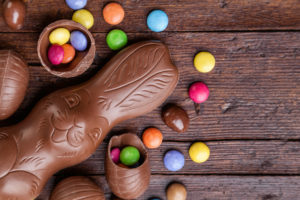 The countries leading the way in Easter chocolate innovation include Brazil, which accounted for 11% of global Easter chocolate product launches in 2017, followed by the UK, South Africa, Germany (each with a 10% share) and France (9%). Reflecting the importance of seasonal products as a whole, in 2017, almost a quarter (23%) of global chocolate launches were positioned as seasonal, such as Christmas, Easter, Valentine’s Day and Halloween. Overall, the US and Germany lead in terms of total chocolate new product development (NPD), each accounting for 8% of new product launches in 2017. This is followed by France (7%), the UK (5%) and Brazil (4%). Across the globe, it seems no one loves chocolate quite as much as the Brits. The average Brit devoured 8.4 kg worth of chocolate in 2017. 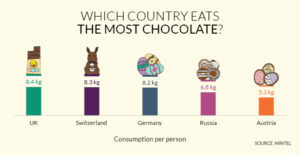 Hot on the heels of the Brits, Switzerland consumed 8.3kg, closely followed by Germany at 8.2kg. Within the top 10 chocolate per capita consumers, Russia experienced the biggest increase at 2.2%; meanwhile, Austria reported the sharpest decline at -1.9%. While the lure of chocolate remains strong, it seems many consumers are enjoying it with an element of self control. According to Mintel GNPD, global launches of chocolate products described as “bites” have grown 50% over the past five years; with “thins” not far behind, increasing 48% over the same period. But just as bite-sized formats are increasing in popularity, consumers are losing their appetite for “light” versions of confectionery (such as low-sugar or low-fat varieties). Launches of products described as “light” fell by 22% between 2013 and 2017. “The growth of bite-sized chocolate points to the ongoing trend of permissible indulgence. Pre-measured, 100 calorie packs of chocolate or other treats have fallen from favour as consumers move away from diets that focus on strict calorie counts. Offering consumers a ‘bite’ or a ‘thin’ piece of chocolate provides an easier way to measure intake, and one that allows for a bit of wiggle room.” Adds Marcia. 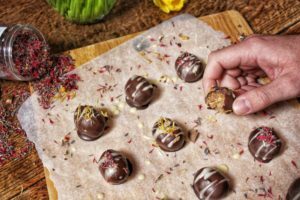 Mintel research highlights considerable potential for vegan chocolate across Europe. More than half of chocolate eaters in Spain (55%), France (53% ) and Poland (53%) are interested in vegan chocolate, with their counterparts in Italy (48%) and Germany (44%) lagging only slightly behind. Vegan confectionery is also slowly being introduced into the UK: in 2017, 8% of chocolate launches in the UK were vegan. “There’s currently a focus on plant-based eating in the chocolate sector. 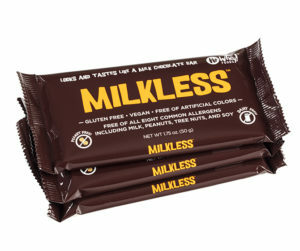 Manufacturers have responded to the growing interest in plant-based diets by replacing dairy milk with nut- or grain-derived milks in milk chocolate products. In some markets, this may be responding to a potential, but not yet articulated need.” Marcia adds. At home, Mintel forecasts that sales of Easter gifting products (such as confectionery, in-home food/drink, flowers etc.) will rise 2.6% in 2018, making the seasonal retail event worth an estimated £590 million to UK retailers.